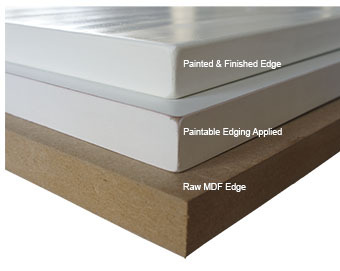 Looking for an Easier Solution to the Preparation of MDF Edges? MDF is a great choice of material for cabinets, furniture and panelling. The problem is how do you deal with the porous edges of the MDF boards? There are many techniques such as treating with PVA glue, primer or filler, these work but are time consuming and can be messy. A excellent alternative is MDF Edging Tape, know as Paintable Edging Tape, which is an effective way to achieve smooth & professional looking edges on your boards, ready for painting, quickly and cleanly. Our Paintable Edging is pre-glued and can be applied with an edge banding machine, or simply ironed on with a normal household iron and the excess trimmed off. A light sanding along the top, bottom and corners where the edging tape meets the board and it's ready for painting. Any type of paint can be used. It is also suitable for spray painting. See our guide on How to Apply Edging for more information. The MDF edging tape is extremely easy to work with, taking all of the hard work out of MDF edge preparation. It can also be used for edging Plywood, Blockboard, Chipboard and other panel edges. Our pre-glued Paintable Edge Banding is available in the following widths 22, 30, 40, 45 & 50mm, at a thickness of 0.4mm. 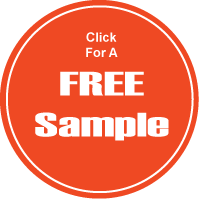 Samples are also available. 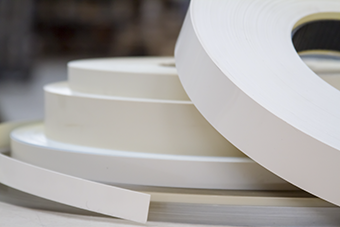 We also stock un-glued Paintable Edge Banding which can be used with another adhesive such as a Contact Adhesive and is suitable for using with glue pot Edgebander Machines. Available widths are 22, 30, 40, 45 & 50mm.